and Computers for 26 years. 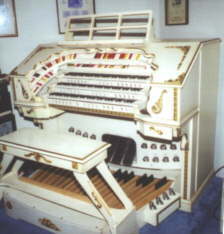 in Anaheim, California playing their Mighty Wurlitzer Theatre Pipe Organ. He has been featured on such TV programs as the "CBS Evening News"
the theatre organ, and its music. performed in the past years. screens, and lots of other stuff. Bassonova, Rockaballad, Swing, Six Eight, Fox Trot, March-Polka. Lowrey Strings, Rhythm Ace, and PA through a 6-channel mixer. from speakers and tone cabinets. Reisner pipe organ blower - 6"
cello, violin, bass, piano, banjo. piano, slow piano, slapback piano. strings, stereo tremolo strings, octave strings. that processes all signals digitally.